The Indian Ocean Tsunami of December 26, 2004 killed over 220,000 people and affected two million more in Indonesia, Thailand, Sri Lanka, India and other Indian Ocean nations. As the world reels under the impact of more recent disasters in Haiti, Peru and Pakistan, we consider lessons learned about postdisaster relief and recovery from the aftermath of the tsunami in Sri Lanka. The tsunami waves caused by an undersea subduction earthquake off the coast of Sumatra devastated 70% of Sri Lanka’s coastline and killed 35,000 people. Days after the disaster, Dennis McGilvray joined forces with Michele Gamburd to organize an interdisciplinary team funded by NSF’s Human and Social Dynamics program to conduct research on the aftermath of the tsunami. The team included a political scientist, a demographer, and three cultural anthropologists; two disaster studies specialists later joined the group. 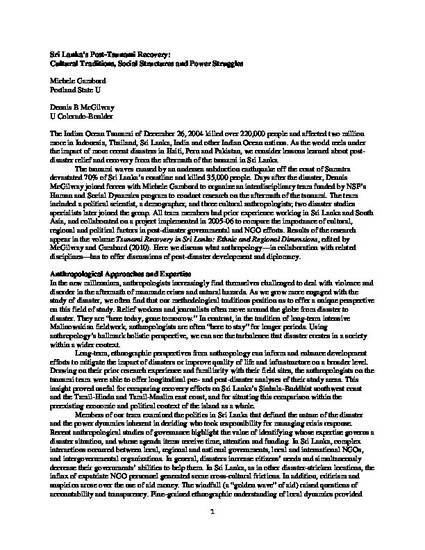 All team members had prior experience working in Sri Lanka and South Asia, and collaborated on a project implemented in 2005-06 to compare the importance of cultural, regional and political factors in post-disaster governmental and NGO efforts. Results of the research appear in the volume Tsunami Recovery in Sri Lanka: Ethnic and Regional Dimensions, edited by McGilvray and Gamburd (2010). Here we discuss what anthropology—in collaboration with related disciplines—has to offer discussions of post-disaster development and diplomacy.